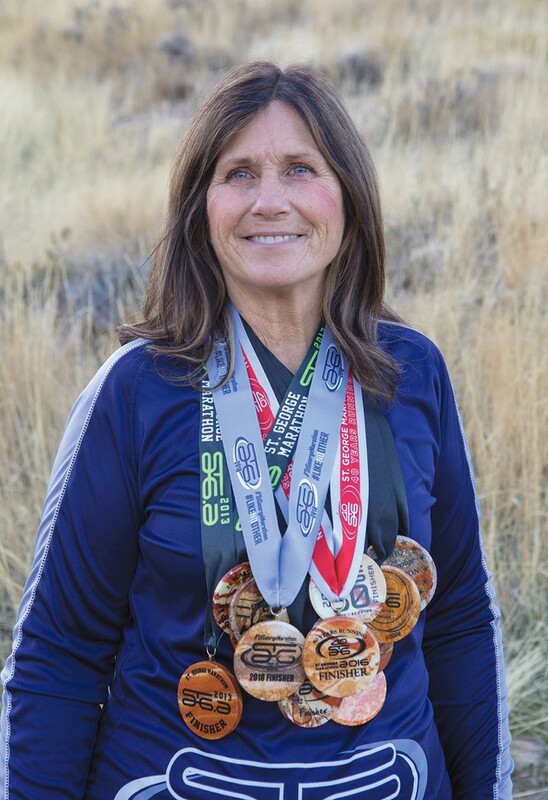 Liz Dalton wears 20 finisher’s medals from 20 St. George Marathons she entered and completed. 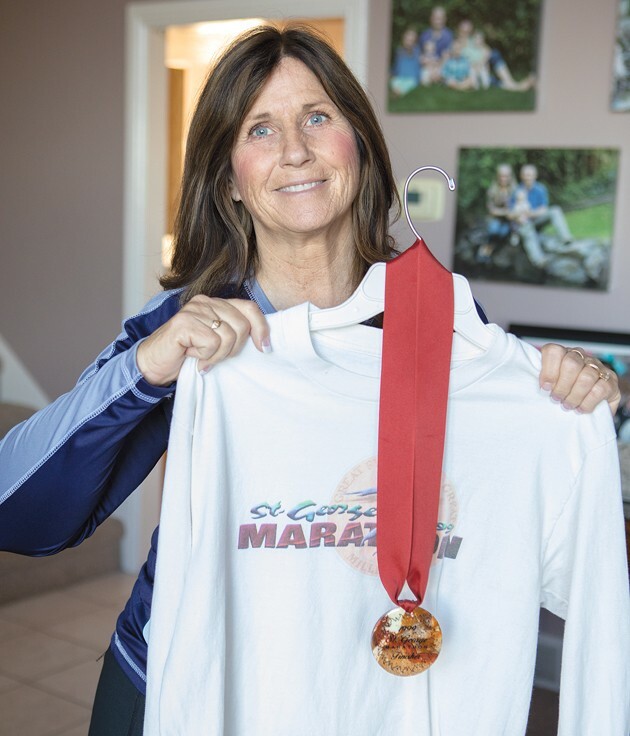 Dalton gained membership into the marathon’s 20-year club after running in her 20th consecutive St. George Marathon this year. 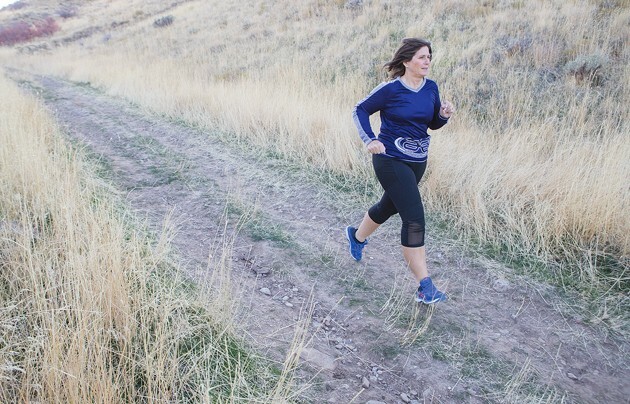 Dalton uses the hills behind her home in Tooele as part of her training regimen and to prepare for the St. George Marathon. 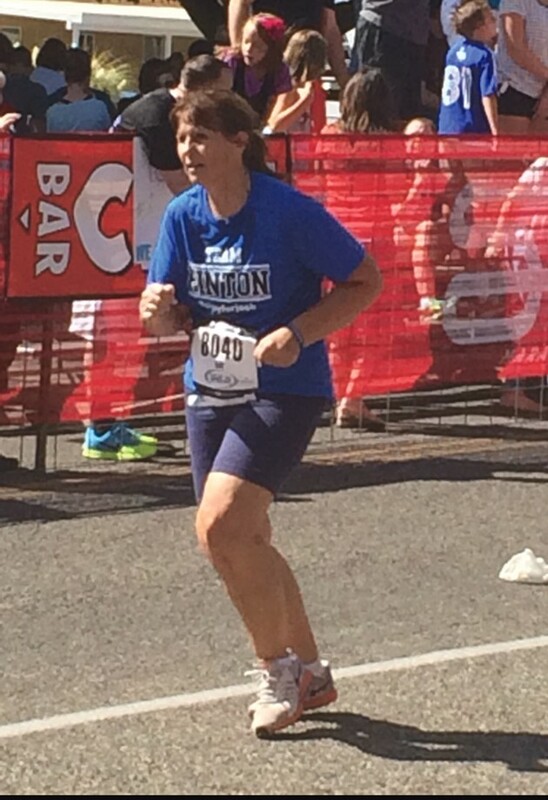 Dalton says she didn’t commit to running 20 consecutive St. George Marathons until she had run her 16th marathon. In an era when Internet memes that mock failed goal-keeping attempts are more common than actual tales of stamina and dedication, meet Liz Dalton. 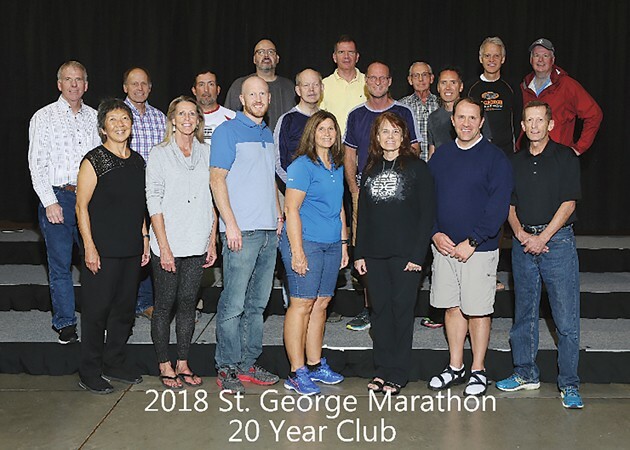 The 59-year-old Tooele native was inducted into the 20-year club at the St. George Marathon on Oct. 6, culminating two decades and thousands of miles of pavement-pounding, sweat-induced and sometimes pain-riddled devotion to the act of staying active and healthy. It’s a story that almost wasn’t, but even despite the injuries, road blocks, and dark, sometimes lonely mornings, Dalton, who teaches family and consumer science at Stansbury High School, wouldn’t have it any other way. With a young family at home, repeated pestering from a close friend to train for the 26.2-mile race was avoided for years until finally she agreed. But she made no long-term promises. And there she was the next year — running through the red-rock landscape of the sunny southern Utah town. She blamed it on a friend luring her in once again by saying he needed help training for two more marathons to make it into the 10-year club. “He said, ‘If you do that I won’t bug you anymore,’ ” she said. But after three years she didn’t need help with the motivation any longer. She was hooked. But, if she was going to make any goal it was going to be that she run consecutive races and not press pause until she reached a similar fete. 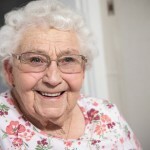 “There’s not many people who have reached the 10 or 20-year club by running consecutive races,” she said, her go-big-or-go-home attitude peaking through. Dalton said the mostly downhill race, with red, high bluffs scraping the blue sky, and usually comfortable weather, seems deceptively easy to onlookers. “It tears up your quads,” she said. Dalton faced some other obstacles along the way to her proverbial finish line. A slower pace meant the possibility of not finishing the marathon entirely. For safety reasons, runners who don’t make it to mile 23 by 1 p.m. on race day aren’t allowed to finish and are instead bused back to the finish line. In 2018, and on the brink of a long-time goal, Dalton started getting plantar fasciitis. Running through the pain, she beat her 2017 mile-23 time by three minutes. As she crossed the finish line the clock read 6:33 — a time over two hours slower than her first marathon decades earlier, but not any less treasured. As training companions continued to drop out over the years to injury or other interests, Dalton only had her goal — and accumulated finishing medals that she’d hang around the house— to motivate her to get up at 5 a.m. almost daily to get her average five-mile run in. Because running can be hard on the body, Dalton agrees that it’s not for everyone. But, for her, the benefits have far outweighed the negatives. 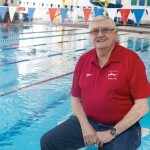 Now even some of her children, who use to chide her on her obsession with the sport, are active participants as well. “They used to always make fun of me and now I’m making fun of them,” she said. 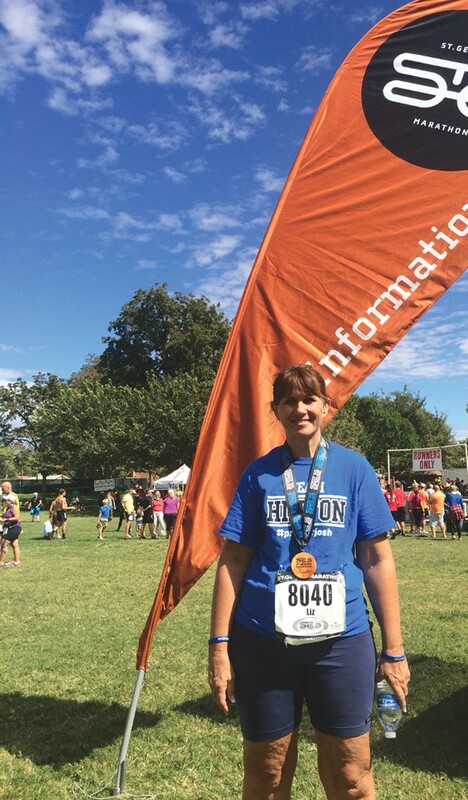 Her plantar fasciitis has kept her sidelined since the marathon, but it hasn’t kept her off her feet completely. 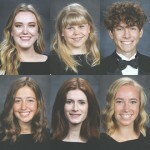 It won’t be long before Tooele County residents start seeing Dalton out running on Droubay, Bates Canyon or Skyline Drive again. She’s determined to not let injury keep her from lacing up her running shoes and hearing the rhythmic thump of her feet against the road.